Leach also says he's confident in WSU's new backup QB, redshirt Tyler Hilinski, after the recent departure of Peyton Bender. 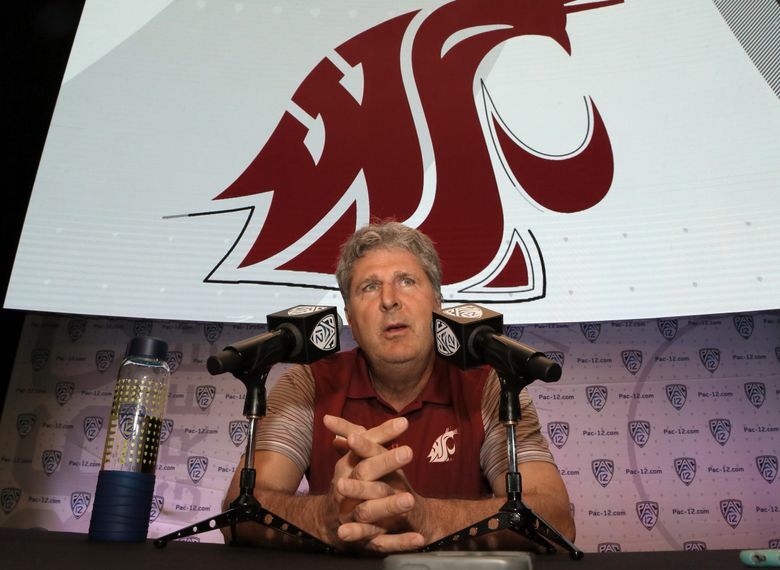 HOLLYWOOD, Calif. — Even with the recent departure of Washington State’s primary backup, Washington State coach Mike Leach is comfortable with the Cougars’ quarterback situation, so much so that he says junior Luke Falk should be a Heisman contender this year. Falk is coming off a breakthrough sophomore season in which he led the nation in passing, average 380 yards per game, with 38 touchdowns and eight interceptions while leading the Cougars to their best season in 12 years. Falk’s emergence, no doubt, is one reason many believe the Cougars can build off last season’s 9-4 finish. WSU was picked to finish fourth in the North in the Pac-12’s preseason media poll released Thursday. Leach said Falk “should have” won the Heisman last year. Falk will have a new backup this season after Peyton Bender became academically ineligible this summer. Bender, who started the Apple Cup last season in place of the injured Falk, plans to transfer to a junior college in Mississippi. Leach didn’t completely close the door on Bender returning to WSU after this season. For now, though, he said he’s confident in redshirt freshman Tyler Hilinski as Falk’s primary backup. The Cougars also brought in a junior-college transfer, Anthony Gordon, in May. “I don’t know how much (Bender’s departure) impacts the depth,” Leach said. “He and Tyler Hilinski were really battling it out (in the spring), and Tyler was doing a really good job, and I also think that was part of what contributed to that. Peyton wants to get on the field. Leach was asked several questions about the Cougars’ much-improved defense in 2015, led by first-year defensive coordinator Alex Grinch. Was Grinch’s immediate influence greater than what Leach had initially envisioned? A year ago, the Cougars were picked to finish fifth in the North. They wound up going 6-3 in conference, finishing third in the North, and the defense was a major reason why. In 2014, the Cougars allowed 38.6 points per game; in 2015, they allowed 27.7. Grinch was rewarded with a three-year contract extension after the season. “Well, you know, the one thing that was hard gauge with us last year is we were an incredibly young team,” Leach said. “As you look around, and you can go through the roster and add it up, there were a bunch of people that never even played college football there. They never even played. They had heard about it, they liked it, they had games on their phones and everything else where they pushed a bunch of buttons and they thought about college football, but they never even — they’d never even played, or unless they knew somebody, they’d never even been on a college sideline. The challenge now for Grinch and the Cougars is to do it again.